As the school holiday ends we begin to think about school again. 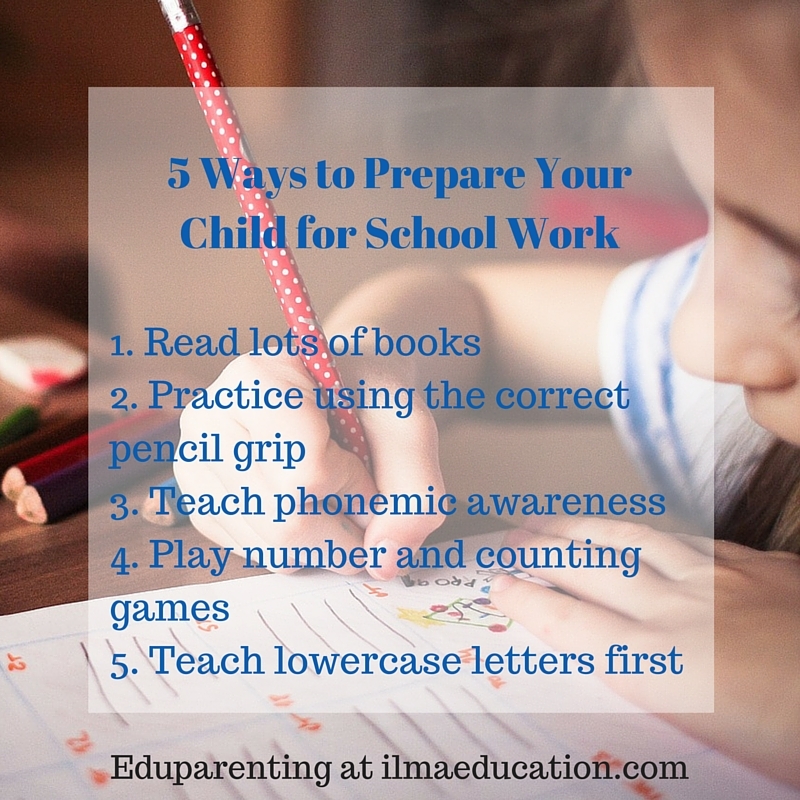 Like most parents, you scramble to prepare your child for school. 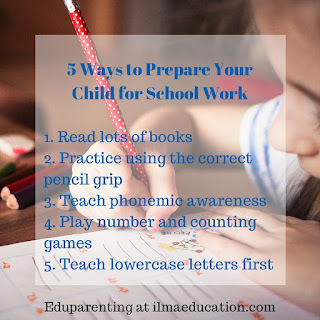 With this in mind, I’ve prepared a list of the most important things you can do to help your child be ready for schoolwork. This goes without saying, most parents should know this by now. I’ve written many posts on this but no list is complete without this. I’ll say it again, read to your child all the time. It’ll develop his love of reading and make learning to read that much easier. To be able to write, your child would need to be able to hold the pencil properly. Holding it wrongly will put your child off writing. He will hate it because it feels uncomfortable. I’ve had children who were very bright, they could do everything. They know their letters and numbers. They could write them but they hated to do so. The problem was that they weren’t holding the pencil correctly. It made their fingers and hands ached, they got tired from it so they avoided writing. Holding the pencil correctly will allow your child to write easily. His grip will be relaxed and so the letters and numbers will come easily and smoothly across the page. If you see your child holding his pencils incorrectly then immediately correct it. Be consistent. Do. It. Every. Time. The longer you leave it the harder it’ll be to correct because by then it’ll have become a habit. The other problem for some children is that they don’t hold any writing implement often enough. Their grip is very slack. You put a pencil in their hand and the pencil falls off or they hold it like they’ve never held a pencil before. The reason here is that parents don’t give them enough practice. Throughout their young life they haven’t had much experiences with scribbling, drawing and painting. Give your child a crayon, pencil, marker and paintbrush and let him doodle away. Do not be afraid of any mess that may result. You don’t need to teach letters yet. All you need is to teach your child to be aware of the sounds in words. To be able to read and write, your child needs to be able to hear and reproduce those sounds that he hears in spoken words. This is the beginning stage of reading. If your child can’t hear the sounds then it’ll be very difficult for him to start to read or write. Phonemic awareness activities include playing with rhymes, listening for the first sound in words and the last sound in words. For example, what I usually do is over exaggerate one of the sounds. So if I wanted children to hear the s sound in snake, I would say sssssssnake and ask them what first sound they can hear in that word. Rote counting to 10 is so easy for children to do because young children can pick up the language spoken to them and imitate it easily. This is why every parent should teach their child to say the numbers to 10 first then to 20 later. Of course, it doesn’t mean that your child will understand what each number means yet but it’ll help your child later to sequence numbers. Playing with magnetic or playdough numbers, or any other physical representation of the numbers, will help your child to recognise them individually later on. So providing your child with these activities will really prepare your child for number learning. I’ve included this one because, time and time again, I’ve encountered children whose parents had taught them capital letters. Many parents believe that they’re helping their child by teaching them capital letters but really, it’ll be more helpful if they don’t teach them letters at all. I’d rather children come in to learn with a blank slate rather than with a knowledge of capital letters. It makes learning the lowercase letters harder for them. They’ve memorised what the capital letters looked like and how to write them so it comes automatically for them. But after I’ve taught them the lowercase and asked them to write their abcs in lowercase, they couldn’t do it. Then when we started to write sentences, all of their sentences were capitalised and it was really hard for them to switch to lowercase. Sometimes when they remembered a letter or two in lowercase their sentences WouLD LooK LiKE THis. Parents, if you want to help prepare your child for writing then please teach lowercase first. I know it’s easier to teach capitals because the lines that form the letters are straight and it’s easier for your child to write straight lines than curved lines. This is why your child will pick up capital letters easier when he’s learnt the lowercase and you don’t have to spend so much time teaching capitals.